If you’re a handy homeowner that loves tackling construction projects at your residence, American Metal Roofs can help. We are proud to offer a Do-It-Yourself program, in which you, the homeowner, install the metal roof yourself. After installing over six million square feet of metal roofing since 2000, we have the knowledge and experience to not only expertly install metal roofs, but also to teach homeowners how to do the same. Best yet, our Do-It-Yourself program can help you save 50 percent off the cost of having a metal roof installed. 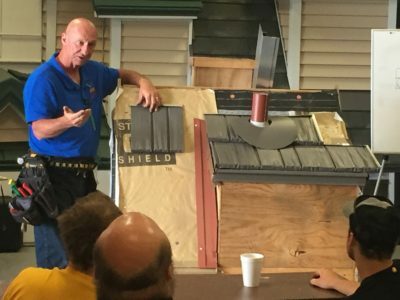 Our Do-It-Yourself program puts you in charge of your metal roofing installation, and we’ll provide you with all the training, materials, and support necessary to ensure an accurate installation at your home. Call (844) 638-2576 or complete the form below to request a seat at an upcoming DIY Seminar from American Metal Roofs. Once a month, we hold a monthly seminar that involves hands-on training with one of our installation craftsmen, located in our Flint or Charlotte showroom. You’ll receive step-by-step video training, where every stage of our installation process has been documented, filmed, and explained in everyday terms. We’ll sell you the supplies necessary for your installation. You’ll choose styles and colors, ensuring the perfect match for your home and design tastes. Whether you choose to use our 800 support line or have an expert installer on-site to provide assistance, we’re there for you every step of the way. By completing the form on this page or by calling the special DIY Program phone number (844) 638-2576, you are requesting a seat at the seminar you select. Your place at the seminar is not guaranteed and is at the discretion of American Metal Roofs. We have limited space available and we may not be able to accommodate all that wish to attend. Upon receiving your request for a seat at one of our DIY seminars, our next step will be to help you complete the DIY Seminar registration process. Our goal is for your DIY project to go as smoothly as possible, so we will want to make sure your upcoming project is a good fit for our program. We’ll have some questions for you and have you send us completed drawings of your project. Once you have completed the registration process and we have approved your seat request, we will issue your tickets for the seminar of your choice. Call the exclusive DIY phone number (844) 638-2576, or complete the form below, to request a seat at an upcoming DIY Seminar.